Have you checked your cholesterol lately? It may seem like a small detail in your health journey, but cholesterol health is important for everyone of all ages. Whether you have high cholesterol or are trying to prevent it, it’s never too late to improve your health. Here are four must-have foods to help you do just that. What is cholesterol, and why does it matter? Cholesterol is a waxy substance that’s found in the fats in your blood. Not all cholesterol is bad, as your body actually needs cholesterol to continue building healthy cells. However, when you have high cholesterol, you can develop fatty deposits in your blood vessels. If there is fat build-up in your blood vessels, it can become difficult for enough blood to flow through your arteries. Your heart may not get as much oxygen-rich blood as it needs, which increases the risk of a heart attack. High cholesterol can be inherited, but it can also be controlled by regular exercise and staying smoke-free. The primary way to lower or prevent high cholesterol levels is to eat the right foods! Keep reading to find out which foods will help you prevent and battle high cholesterol levels. Any food made from wheat, rice, oats, corn or another cereal is a grain product. Consuming whole grains like, whole wheat, oatmeal, rye, brown rice, wild rice and quinoa, can significantly lower cholesterol levels. Whole grains are packed with essential vitamins like thiamin, vitamin B2, niacin and folate. Eating whole grains can boost your iron levels, which carry oxygen to the blood. Since having high cholesterol can make it difficult for the body to transport blood and oxygen, increasing iron levels by eating whole grains is vital. Whole grains that are high in viscous fiber, such as oats and barley, can decrease serum low-density lipoprotein cholesterol and blood pressure and improve glucose and insulin responses. Grains that are high in insoluble fiber, like wheat, can lower glucose and blood pressure and provide a prebiotic effect. Breakfast is the most important meal of that day and eating a well-rounded breakfast can not only lower cholesterol but reduce your calories for the remainder of the day causing weight loss. Studies show whole-grain diets can lower total cholesterol levels by an average of 4.6 points and meal plans featuring oats can drop cholesterol levels by 6.5 points. Try this Apple-Cinnamon Granola as a low-calorie, cholesterol-fighting recipe. The whole grains in granola are a flavorful way to promote heart health. The oats in this recipe contain soluble fiber, which reduces bad cholesterol. Preparing this granola recipe will allow you to keep the sugar content low in comparison to high sugar, processed store-bought brands. Everyone knows the old adage, “an apple a day keeps the doctor away,” but did you know that apples are the best fruit to eat to lower cholesterol? Apples are a sweet snack that provide many benefits. Apples contain antioxidants and pectin that can lower “bad” LDL cholesterol and fight inflammation. LDL cholesterol and inflammation are known triggers of premature aging and disease. Apples also contain vitamins A and C, which are good sources of antioxidants, the substances that can protect your cells from the effects of free radicals. Free radicals are harmful molecules produced when your body breaks down food. Apples also contain soluble fiber, which can help lower glucose levels as well as help lower blood cholesterol. Studies show eating the Golden Delicious apple, a type of apple that is characteristic for its yellow color, can decrease levels of serum triglycerides (TG) and lipoprotein-cholesterol (VLDL) in hyperlipidemic and overweight men. You might need a mint after adding garlic to your meal but this flavorful condiment not only reduces inflammation, but it also fights oxidation. The antioxidants in garlic fight oxidation to protect the blood vessels from being damaged. Garlic may reduce total cholesterol and triglyceride levels and can be beneficial for people at risk for high cholesterol. Consuming a mixture of garlic and lemon juice can decrease levels of cholesterol. Mixing 20 grams of garlic daily and 1 tablespoon lemon juice can improve lipid levels, fibrinogen and blood pressure in patients with hyperlipidemia between the ages of 30 and 60, according to this study. I’m sure most people will be excited to hear that eating dark chocolate can improve cholesterol levels! There’s nothing better than a sweet treat that’s also good for the body. Cocoa, the plant used to create chocolate, contains chemicals that can interact with cell and tissue components providing protection against the development and amelioration of pathological conditions. During a study by the Journal of Cardiovascular Pharmacology, research showed an 11 percent decrease in LDL cholesterol in patients after 15 days of receiving 100 grams of dark chocolate per day. 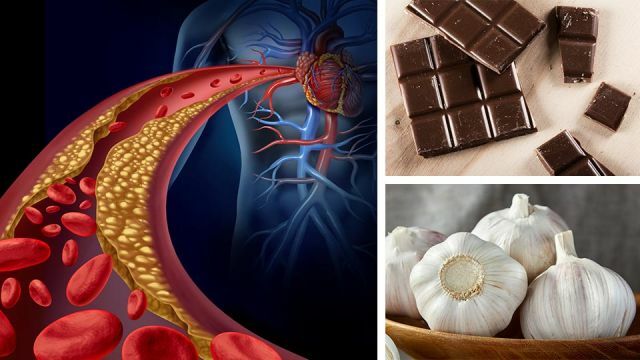 The study demonstrated an increase in HDL-cholesterol, the good cholesterol, in hypercholesterolemic subjects after eating dark chocolate or cocoa powder. Cocoa powder provides a decrease in plasma levels of oxidized LDL plasma levels for those who use cocoa powder as a dietary supplement. Another good reason to consume dark chocolate is for the soluble fiber and minerals found in cocoa, such as magnesium, potassium, phosphorus, zinc and selenium. Eat up to one-quarter cup of dark chocolate or 2 1/3 tablespoons of cocoa a day for maximum cholesterol-warding effects. Dealing with high cholesterol can be tough when you feel like your options for food are limited to bland items. The key is moderation. Maintaining a healthy lifestyle supplemented with exercise, fruits, vegetables and water can help keep cholesterol levels at bay. Try adding whole grains, apples, garlic and dark chocolate to your meal plan for cholesterol-lowering effects. What are your favorite low cholesterol foods? Leave your comments below! Hey Buddy!, I found this information for you: "Eat These 4 Foods Every Day To Lower Your Cholesterol". Here is the website link: https://www.thealternativedaily.com/eat-these-4-foods-every-day-to-lower-your-cholesterol/. Thank you.